Leith Street has reopened to traffic [1, 2] after its 10-month upgrade. But for all the hype about improvements, and there are indeed some welcome improvements, it remains basically the same – multiple lanes of mixed traffic, cyclists travelling uphill surrounded by lorries, cars and buses; and heavily-used footways which at the top are way below Council standards. The underlying issue, the basic reason why cycle and pedestrian provision is still far from optimum, is as before – the Council has not adopted the traffic-reduction measures which would allow a segregated cycleroute right up to the Princes Street/ Bridges junction, and footways enhanced further, with less potential pedestrian/cycle conflict. The brightest spot on the horizon is the City Transformation Project – about which we should know more in the Autumn. This offers the prospect – but far from a certainty – of a rethink on Leith Street. Council officers have indeed been heard to say that a rethink could well be possible as part of the Transformation, if the overall policy brings city centre traffic reduction. Current Council plans for Picardy Place, Leith Walk and the tram extension include segregated cycle provision right from the Foot of the Walk up to York Place and to Leith Street – with some design problems so far, but overall a fantastic development which we hope the Council will refine to produce a facility of which they can be truly proud. At York Place segregation will continue, linking into the CCWEL West-East route through the city centre to Roseburn [1, 2]. However, continuing up Leith Street, the route will get you to … wait for it … Calton Road!! Handy indeed for Waverley Station, but hardly the route of choice for the many local people and commuters travelling between Leith and South Edinburgh or Princes Street!! For those journeys you are expected to mix it with lorries (moving and loading), cars and buses on an uphill and narrowing road. Family cycling is definitely out and the nervous or novice will hardly be encouraged. The lovely 2-way temporary cycle lane which had operated for 10 months during the roadworks has gone, as has even the previous bus/cycle lane. Spokes has, literally for years, been fighting for a permanent segregated cycleroute here – or initially even just the very minimal option of an uphill advisory cycle lane, leading to a deep ASL at the pinch point. For example here from 3 years ago and here more recently. 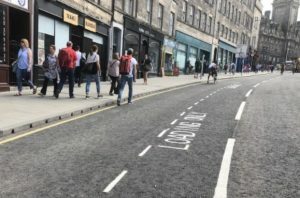 We have failed on this main issue, though have achieved a number of useful tweaks to Leith Street design (see below) – and of course the innovative and hugely appreciated temporary cycleroute during the 10 months of St James roadworks. Official reasoning is that there is space at the top of Leith Street only for 3 traffic lanes – 2 uphill and one for entering Leith Street. The 2 uphill lanes are considered essential to prevent long tailbacks, given the anticipated traffic levels, at least without significant changes to the entire East End junction. The City Transformation project, referred to above, remains the one serious hope. Whilst Leith Street has reopened to motor traffic, the cycleroute up Leith Street as far as Calton Road has been barriered off. Admittedly its value is not huge until it is properly connected at the Picardy Place end – and even more so once it is extended further down Leith Walk. 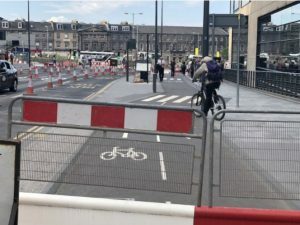 However, with the exception of the barrier which opens onto the road at Picardy Place, it is hard to see why the route needs to be ‘closed.’ Indeed some cyclists will undoubtedly use it, despite having to cycle or push round the barriers. Work on Picardy Place and its cycleroutes is expected this autumn, and will include a southbound connection to the lower Leith Street cycleroute, at which point the route will be ‘opened’ and all barriers removed. Indeed, officers are hoping that a temporary connection allowing this may be possible at an early stage of the Picardy works. Nonetheless, we fail to see why the entire route needs to be barriered now, and we fear this will likely lead to pedestrian/cycle confusion and complaints. There are many other remaining issues, though the two above are likely to be the greatest concerns to most users. The new ASLs and lead-ins are missing the red chip surfacing that is meant to be standard in Edinburgh. This heightens the risk of vehicle encrouchment, particularly once the white lines have faded. Although Leith Street is now open to motor traffic, the signals at Calton Rd and Greenside Row junctions have not yet been installed, a potentially dangerous situation for pedestrians and cyclists. It is worth noting that an amendment [section 13 here] by the 2 Green councillors on the Transport Committee (Chas Booth and Steve Burgess), supported by Labour councillor Scott Arthur, sought to rectify many of the issues in this article, but was defeated 8-3. If you wish to take up any of the points in this article, contact your councillors – find Edinburgh councillors at www.edinburgh.gov.uk/councillors. Please consider emphasising what you hope to see in the City Centre Transformation. Will it be truly transformative, with major traffic reduction, or just another volume on the Council’s digital shelf? It is councillors who will decide.